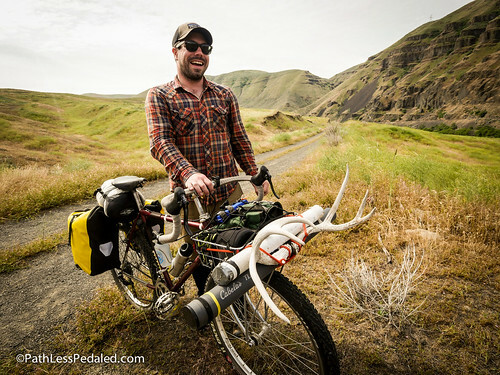 While the Oregon Outback was kicking off in Klamath Falls, we did a little bikepacking mini adventure of our own on the Deschutes. May is known for the epic salmonfly hatch on the D….which we pretty much missed (one lone stonefly did make an appearance at our camp on our final day of fishing to rub salt in our wounds). That said, it was still a fun trip and is probably the most accessible bikepacking trip in Oregon. We shot some video to make a little vignette of the trip, so grab some popcorn. used by the other fellow (deer antler bike). Looks like a very comfortable/practical set up. Thanks for your comments! I really love the way this bike rides, and I’m glad it shows. My bike is an 83′ Stumpjumper with 46cm Nitto Noodles on a Nitto Technomic stem to get the bars at saddle height. This setup worked great for this trip but I am planning on making a framebag and transverse saddle bag for upcoming trips to center the load and prepare for more technical terrain. Thats an early 80s Specialized Stumpjumper. Cool video man! Way more successful than my last trip. Also cool antlers looks real nice up front there! Hope everyone feels as lucky as I do to have Russ and Laura in our part of the country. Great videos and writing. See you on the road.